The word may be of Scots origin, possibly through Old Norse vörðr, meaning "guardian" (cf. the Modern English cognates "ward" and "warden"), and related to Irish arrach, meaning "apparition". An association with the verb "writhe" has also been claimed. Philologist and fantasy author J. R. R. Tolkien held this view , and his use of the word in the naming of the creatures known as the Ringwraiths has influenced creators of fantasy and horror novels, television shows, and games, who use it with its meaning of a shadow-thing, a spirit of another world, or more generally a mysterious being to be feared. The wraith is a being of power, controlled by a greater spirit to do the creatures will. These creatures are shadows, floating amongst our realm with no purpose but that of their masters. They feed on humans, their emotions and their own strength, without these they would cease to exist. Information considering their lesser known qualities is difficult to obtain. 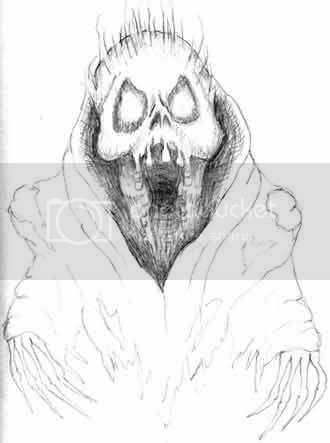 The classic depiction of a wraith is identical to the image of a tall, humanoid figure shrouded in a black cloak, under which no face can be seen, though a hand protrudes. The word "wraith" is also used in modern fiction to signify the shifting wraiths of T.A. Barron's book series The Lost Years of Merlin and the mortiwraiths of Wayne Thomas Batson's The Door Within Trilogy. Whereas the shifting wraith is a bestial, snake-like predator able to change itself into the form of any animal, albeit always having a feature uncharacteristic thereof, the mortiwraith is an anthropomorphically intelligent, gigantic, cave-dwelling, but also snake-like predator having creased, furry ears, poisonous blood, and many clawed legs whose quantity increases with the passage of every five years. The use of the word "wraith" for either of these is not explained by either author in the respective story. In European pagan beliefs, the wraith is seen as a spirit of vengeance. They are said to be ghostly figures with long, sharp fingers. Wraiths are considered rare amongst the spirit realm, for they consist of pure revenge; yet not all wraiths will be truly vengeful, in that some are merely enraged to the extent of destroying anything they encounter. In a local legend of Cornwall, the Polbreen Mine is said to be haunted by a wraith named Dorcas. In other corners of the world, the wraith is considered to be the reflected image of a person, seen immeditately before death. This side is supported by the elders' stories. A wraith is also described as an image seen just before one dies, like a premonition.